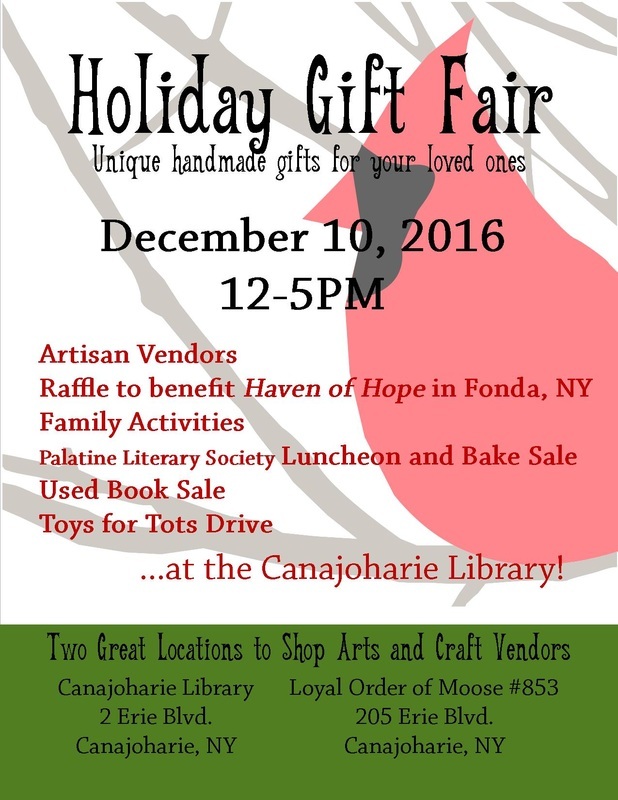 The Canajoharie Library will have its annual Holiday Gift Fair on December 10, 2016 from 12-5PM. Get your Christmas shopping done locally, and show love to our neighbors this holiday season! This event is free to attend. Artisan Vendors will have booths with arts from photography, watercolor prints, handcrafted quilts, herb plants, wreaths, stained glass, pictoral quilts, custom lamps, handmade jewelry, woodturning, pyrography, lathe turned items, and more for sale! The Herb Cupboard - Herb plants, sachets, seasonings, and herb pillows for sleep, headache, and eyes. Dutchmasters Joinery - Watercolor paintings, notecards, calenders, and restored antique clocks from wooden works to cuckoos. Jewelry By Jean ​- Handcrafted shamballa bracelets, tree of life necklaces, and stained glass trees on sliced birch. Historic Hoffman Farm - original jams, jellies, and chutneys using hand grown ingredients.